Summary: Hunting witches isn't black and white, except that it is. Podficcer's notes: I recorded the version posted here @ silverbullets, not seeing the alternate version until after I'd recorded. Summary: Sam gets banged up during a hunt, and Dean is nice to him. Too nice. Podficcer's notes: For the 'Drag' challenge, because I can't resist something that begins with a drag race. 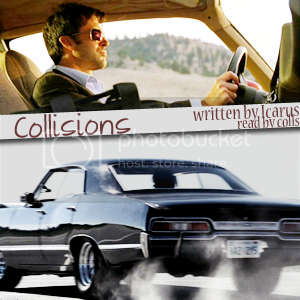 Summary: The engine gunned and they caught up, moving alongside the red car long enough for Sam to catch a glimpse of a guy in a bomber jacket and Aviator glasses, his generous mouth in a hard line – until the guy smirked, and cut Dean off at the next turn. Summary: Written for Stargateland's Anywhere But Here Challenge. There are places that John only let's himself go in the most dire of circumstances. This is one.